The Khmer Rouge regime (1975-1979) left the Cambodian education system in ruins. Millions of people were killed, including the majority of educated people, scholars, professors, and teachers. Schools were destroyed, libraries leveled, and books burned. Notwithstanding the efforts by the Cambodian government and international development agencies to rebuild the educational systems since the 1980s, the tragedy of Khmer Rouge continues to haunt public education today. Teachers have played a central role in the education re-building efforts, yet they remain grossly underpaid. According to official statistics, in 2010-2011 there were 88,133 public school teachers in Cambodia, receiving wages in the range of just $50.00 to $100 per month. With this wage they have to teach a minimum of 16-18 hours per week. According to a Cambodia Independent Teacher Association (CITA) study from 2010-2011, primary school teachers received $50 per month with required teaching of at least 16 hours per week, lower secondary school teachers received $75 per month, and upper secondary school teachers received $100 per month. The study also showed that the wages increased by 120% for the primary teachers, 60% for the lower secondary teachers, and 20% for upper secondary teachers so that they could afford a decent standard of living (for example, basic food cost is placed at least $19.80 per month). With wages at their current levels, teachers struggle to survive. More than 90% of teachers work second jobs in order to support their families. After school hours, many female teaches often sell snacks and phone cards on school campus, while male teachers work as motorbike taxi drivers or other jobs in order to supplement their incomes. One of the main sources of additional income for many teachers is private tutoring. One student said: “I can’t pass the test if I don’t take a private tutoring class.” In private tutoring, teachers provide answers to the tests in order to attract more students to pay them. Some students have to drop out of school because they are unable to afford tutoring and subsequently fail their exams (IRIN, 2008). From my own experience as a high school student in Cambodia, I had to take private tutoring classes in order to prepare for the mid-term, final, and national exams. Those sessions were not provided in the formal classroom, but through private tutoring. To prepare for university exams, we needed “special private tutoring,” which was conducted by the teachers who were involved in issuing the exam questions. We often discussed how important it was to take tutoring with particular teachers who had been known to be involved in the college entrance examinations every year. However, I could not afford it. And so couldn’t many other Cambodian students. Private tutoring is not the only additional income tool for underpaid teachers, however. Teachers involved in college entrance exam and high school exam also earn money by selling question and answer books before the exams. Usually, one day before the exam the books are available for purchase on the streets almost everywhere especially in main cities. 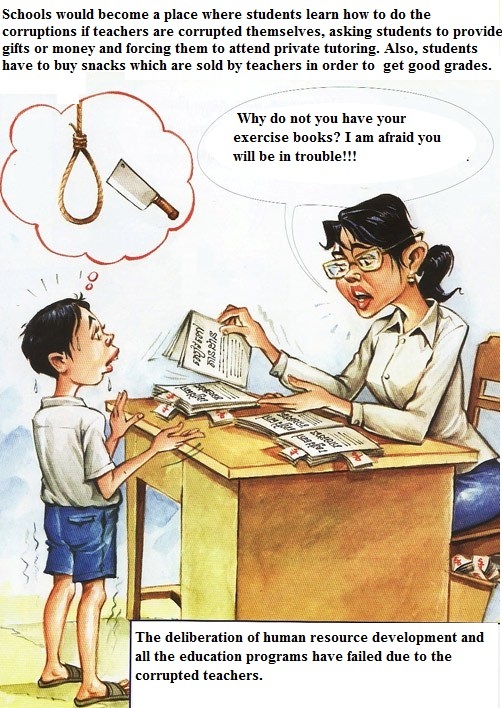 Every year before the national exam day, groups of students buy the question and answer books in order to help them during the exam day and, worse still, the students even pay the teachers during the exam so that they can open the books for the answers. This culture is well known by all but it does not seem to change, despite the many negative repercussions for students and wider society as a whole. Who should be leading the change and how? Because teachers receive low wages, corruption has become the norm and quality education in unaffordable to many students. This raises many questions. In order to provide a better quality of education, should the first priority of government be aimed towards supporting and motivating the teachers? How could communities support the teachers? And, what have UNICEF, UNESCO, the World Bank, and other international agencies done for Cambodian teachers since they began to work in the country? Great essay. You’ve raised some very interesting and important points. Is there any move to increase the number of hours teachers work along with an increase in pay? That would seem to benefit the students, teachers & their families. Thank you Karen and good questions and that the government , NGOs and UN agencies should think about. I think its hard for the government to have the budget to increase the teachers as you could find how much the government loans from the World Bank in each year. I also think that the the government become more dependent now since there are many NGOs and UN agencies are helping. That true event in Cambodia I think. I also agree with your description and it’s good topic.